Wladimir Klitschko – No Country for Old Men? Boxing fans, as we know, are never slow about coming forward. In fight terms, we are marauders who throw vicious punches with bad intentions and social media is the canvas that we dance upon. Since the moment that third man, David Fields, called a halt to the action between Anthony Joshua and Wladimir Klitschko, fight fans have gone toe to toe. ‘Joshua is the new Ali …Joshua would have beaten Tyson …Joshua begins a new era’, with one BBC journalist stating that Joshua is ‘unquestionably the biggest star in boxing’. I always think it’s wise to question the ‘unquestionable’. I’m sure GGG, Pacquiao, Crawford, Canelo and even Mayweather (Touting a comeback) would have things to say on that matter. Deontay Wilder might feel justified in claiming that Joshua isn’t even the biggest star in the heavyweight division and, I suspect, the Bronze Bomber will be eager to prove that point sooner rather than later. While the spoils have gone to the victor, the knives have been sharpened for the fallen idol. ‘Klitschko was exposed…. Klitschko is washed up… Klitschko was destroyed’ and the calls for his retirement have come from both the callous and the concerned. Some have looked back on a great career and said that the Joshua bout was a fitting end as old father time was left in the dressing room for ten pulsating rounds. I think that, comments aside, the truth lies somewhere in the vast middle ground. Joshua is a truly fine talent and I have been singing his praises since before he lifted Olympic gold in 2012. He has developed into an exciting professional and, if we consider that he is still a work in progress, the future is bright for both boxing and the man himself. But progress comes with competition and, other than Wilder, I simply can’t see the bouts that can define him in the way that Ali, Frazier, Foreman and Norton pushed each other to true brilliance. Before the Wembley bout, Klitschko said that great fights were about exposing weaknesses and not just relying on strengths. If that’s the definition of greatness, then Anthony Joshua and Wladimir Klitschko are genuinely great fighters as they found every hidden flaw in each other and the true winners on April 29th were the fight fans. It may transpire, when AJ hangs up his gloves, that the Klitschko bout was his finest moment and Wladimir was his defining fight. To get off the canvas after a right cross like that was a moment he will recall in his toughest fights ahead. Had Klitschko capitalized in the minutes that followed, the world would have hailed a new ‘old’ champion and father time would have left the stadium alone. With all the credit due to Joshua, Wladimir Klitschko is still a huge and powerful prospect for any fighter in the heavyweight decision. Age aside, the man hadn’t fought since 2015 and was subject to the stop/start antics of The Gypsy King, Tyson Fury, on their contracted rematch. Wlad could have taken the easy route by facing Luis Ortiz for the vacant WBA title but, if he was to be the best he would have to beat the best and he came back against the young lion. It was a gamble that very nearly paid off and he was outstanding in the bout. With the exception of Wilder, no other heavyweight in the world today would have brought Anthony Joshua so far into the trenches and, in doing so, he contributed everything to AJ’s great victory. 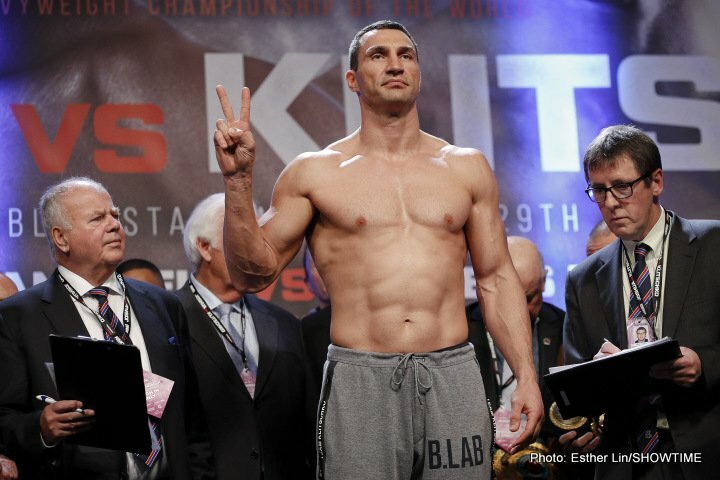 Should Klitschko decide to fight on, world titles still await his name. He would make short work of Joseph Parker in a WBO bout and he would dispatch the winner of Briggs vs Oquendo out to pasture when the WBA belt finds a new home on June 3rd. A rematch with Fury would be sweet revenge and the best of the rest, Ortiz, Ustinov, Takam, Whyte etc are no more than a night’s work for Wlad in my opinion. I have a huge respect for Wilder. He may not have the silky skills of Joshua but, as he says himself, with his power he doesn’t need to be a textbook fighter. If Klitschko announces that he is fighting on, he will clean up the other belts and face the winner of Joshua vs Wilder and that would be a fight to savour. On the other hand, should he decide to call time, he leaves us with moments that define an era in the lives of honest fight fans and we’ll thank him, as fight fans do, by keeping his memory alive in the fierce debates that will surely follow. Next boxing news: Ranking today’s top-10 heavyweights – now who’s top dog? You are here: Home / Boxing News / Wladimir Klitschko – No Country for Old Men?